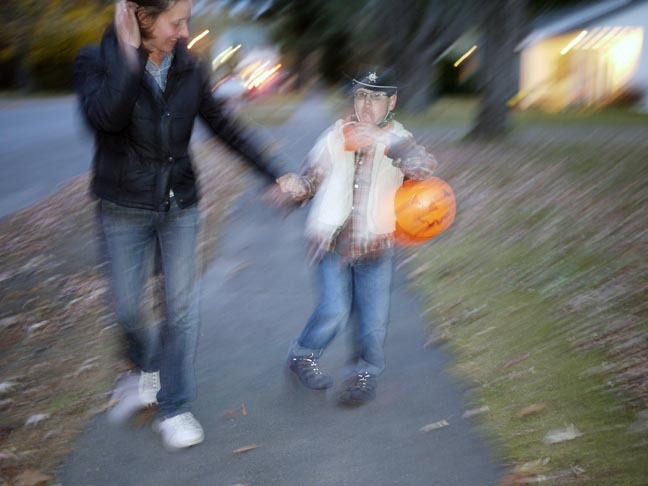 Yesterday, I started writing about Halloween, about how we’d had high hopes for taking Calvin trick-or-treating for his first time ever, and how we had decided to bag it last minute because of Calvin’s downward spiral. I started writing about his turn for the better, which encouraged us to take him to five or six homes all within a half block our ours. Our little cowboy was a trouper, and I wept as our neighbors welcomed him with warm hearts and inspiring cheers. He did so well it aroused suspicion in me that a seizure was on its way. But mostly I was proud of us all for taking another step outside of our comfort zone and into the larger world. Yesterday, I started to write about Marty and John who’d come to the door with their kids and had given me a couple of wonderful hugs, and about Lauren, Sarah and Luz who dropped in, all gussied up, to try to coax me into having a drink with them at our local Mexicali bar. I started writing about Kathy and her son Felix, a neighborhood boy who was born in a labor and delivery room adjacent to the one Calvin and I had been boarding in during the first fragile weeks of his life. Felix, along with his older sister Zoe, makes handmade birthday cards for Calvin every year; they’re pretty much the only ones I keep. I watch Felix grow, seeing him ride by on his bicycle nearly every day, and I think to myself, if it weren’t for the unfortunate circumstances surrounding Calvin’s birth and messed-up brain, maybe he and Felix would have been the kind of friends who’d hang out together and perhaps enjoy some of the same things. I’d have liked that. Today, it's the Day of the Dead, and instead of embellishing on Halloween, I’m sitting atop Calvin's changing table in his darkened room, the shade pulled, as he whimpers in bed having spent the night enduring three grand mal seizures—more than half as many as he suffers in a typical month—one failed dose of rescue THC at 10:30 p.m., one failed dose of Diastat, rectal Valium, at 11:30 p.m., a seemingly successful extra dose of THCA oil after the third seizure at 3:00 a.m. (surprisingly, no more seizures after that) then, most regrettably, hours of crying, moaning and vomiting undigested food. Today, it's the Day of the Dead, only nine-thirty though it feels more like noon, having been up most of the night attending to Calvin. And instead of honoring parted souls, I'm sitting here cursing a sinister ghost—epilepsy—cursing the day it began laying waste to my son. I can’t remember the last time Calvin had three grand mals in one night. Perhaps never. As I slept, his arms around my neck, I dreaded having to give him a second dose of the Diastat, a benzodiazepine not too dissimilar to the one we are weaning him off of and dangerous if given too often. I dreaded having to call 911. I dreaded having to pack up and go to the emergency room. I dreaded more failed emergency drugs. I dreaded the nurses poking and prodding him with needles. I dreaded the specter of prolonged seizures, intubations, induced comas, brain damage, perhaps even Calvin's demise on the Day of the Dead. I wonder if the trio of seizures occurred because Calvin has a virus. I wonder if they were induced by the time change. I wonder if puberty might be exacerbating them. I wonder if they are part of the benzodiazepine’s erratic withdrawal symptoms, which are purportedly nonlinear and protracted, occurring spontaneously, not necessarily in tandem with, or limited to, a particular reduction in dose. I’ll likely never know the exact cause of Calvin's seizures, but suffice to say, they are the spector of epilepsy, a most cursed fiend, the likes of which you'd shudder to encounter, even on Halloween. Well, this is exactly what the whole shithouse is like -- exactly. We've got quite the ghouls hanging out here as well. God have mercy on all of us. I just want you to know so appreciate your blog entries. I have no personal connection to you at all, but I started following you after reading a piece of yours in The Sun a few years back. I feel as if I know Calvin, and every time I see his sweet photos I just want to hug him. I only have one friend with epilepsy, so your posts have truly opened my eyes to what a different and complex world you and people with seizures must navigate through. Blessings to you for continuing to share your truth through both joyous times and heartbreaking moments. You are sending ripples out into the world every time you post. I, too, feel like I know your Calvin. I am so sorry that he is having those seizures after a wonderful night out. I am hoping that he and others weaning off those awful meds will get there to some peace to allow more enjoyment of all around them, and to allow their loved ones, peers and community to enjoy them all the more too.